Could you lead the EPA better than Scott Pruitt? Take the quiz and find out! 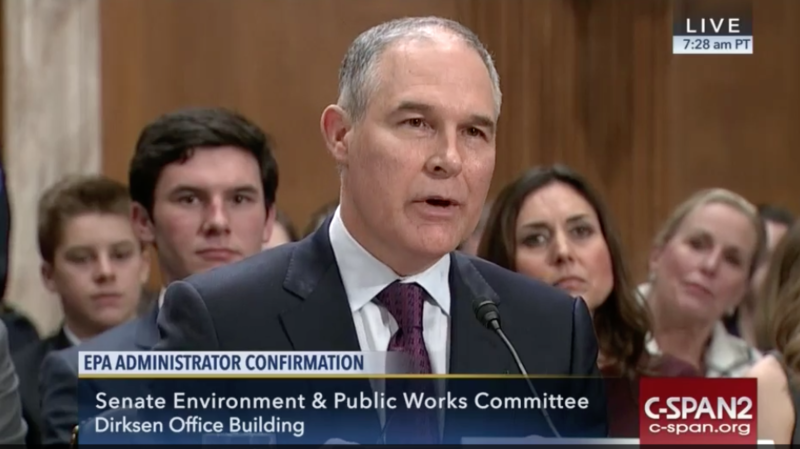 Last week, Scott Pruitt, President Donald Trump’s nominee to lead the Environmental Protection Agency, testified before the Senate Environment and Public Works Committee. Currently the attorney general for the State of Oklahoma, Pruitt has sued the EPA at least 14 times for what he calls “federal overreach” in the agency’s regulations over clean air and water. Pruitt has also taken thousands of dollars in campaign contributions from the fossil fuel industry and, in previous statements, questioned the human forces behind climate change. Thursday’s hearing mixed sycophancy from fellow conservatives and fossil fuel fans, like Sen. James Inhofe, also of Oklahoma, and strident criticism from progressives, including Cory Booker of New Jersey, who stumped Pruitt on a question about the prevalence of asthma among Oklahoma children. After more than two hours of testimony, it became clear that Pruitt didn’t have a firm scientific grasp of the environmental perils facing the country. So we ask you, dear reader, are you better qualified than Pruitt to lead the EPA? Take this test and find out. If 400 students are enrolled at David Koch Elementary School and 10 percent of them have asthma, how many inhalers would be needed to give one to every breathless child? If a coastal highway is at sea level and the ocean rises 3 feet by the Year 2100, when should Bro’s Oyster Bar close and move inland? An 8-ounce glass of water from a household tap contains 10 parts per million of lead. If there is no safe level for lead in drinking water, under what conditions should a person consume the water? Read the paragraph below and mark which of the answers you think is the most accurate. Fracking has been linked to earthquakes, even in areas without natural fault zones, as well as groundwater contamination and methane leaks. If you were in charge of a fracking operation, how would you mitigate the disastrous effects of this drilling practice? c. Hey, is this a trick question?